Luke Langholz Pottery: Lincoln Center's "Mugs, Bowls, and Casseroles" is up! Lincoln Center's "Mugs, Bowls, and Casseroles" is up! I stopped by the galleries at the Lincoln Center last night to check out the setup, and it's one slick show. It's open today (12-9) and tomorrow (10-9). My understanding is that the Gallery will remain open on Sunday as well, but it will be in "show" status only, so no sales. 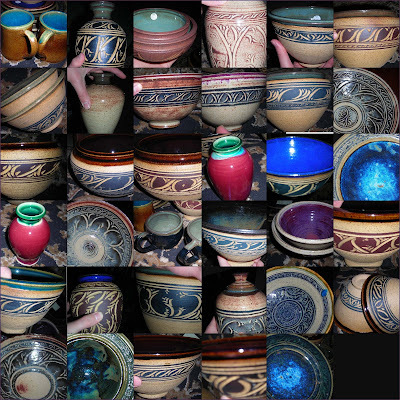 For your enjoyment, here's a sampling of the pots that I put into this show (click on it for a bigger view). I'll be glazing pots this weekend, most likely, and will offer a full recap of my Lincoln Center experience, as well as details about the Guild's Fall Sale next week. Until then, have a great weekend! LOL, Luke thanks for that really constructive comment. I hope I get better at it too. I like the work you're doing. I think I'll add you as the first blog I'm following. Thanks for hitting me up, let's stay in touch.